#1 - How did you launch your project? A group of residents got together; we were concerned that in our Sun City Palm Desert community of 5,000 homes and about 7,000 people, begun in 1992, are many residents who are twenty years older than when they moved in, and need a little help. We decided to try to offer it through a volunteer non-profit. We formed a board of directors and a design for the new “village.” We planned a launch date of March 1, 2011. #2 - What all did you do to prepare before “opening your doors”? The six directors assessed themselves $200 apiece to pay for launch costs, and a few other founders donated $200 apiece. We wrote and printed up brochures aimed at recruiting members and volunteers. We consulted with the general manager of our homeowners association and, as required, presented a petition signed by 100 residents asking to be recognized as a resident group. With official status thus established, we advertised in the association’s newsletter and distributed our flyers and brochures. We wrote procedures for all the service teams, and organized a “Dispatch Team” to take service requests over the phone. We advertized for and trained volunteers. We created software that would be used to track service requests, volunteers’ schedules, membership and volunteer rosters, etc. We created a basic website. We bought insurance, paid filing fees with the State of California and the Internal Revenue Service. Rather than rent quarters, we mostly met in volunteers’ homes. For larger groups such as the service teams, we rented meeting rooms from the association. #3 - What services do you offer? Our first acquaintance with the village concept was through our main founder’s knowledge of the Beacon Hill Village (he is a transplanted Bostonian). However, we did not need to replicate the Beacon Hill Village concept of full services and social activities—our gated community is extraordinarily rich in clubs and events. We decided to stick to basics. The services we decided to offer were: rides or errands to local destinations, simple handyman tasks, a daily morning phone call, emergency pet care, and loan of medical equipment such as walkers, shower seats, toilet seat risers, etc. (this service was later discontinued due to lack of member interest), all services to be provided by volunteers. We offer no entertainment, social, travel, or educational components. We work Monday through Friday each week but no holidays. Initially, we charged only $50 per household per year, entitling the household to six services per month. We have since raised the annual fee to $100 per household to provide the six services.Also we have added a few wrinkles to our basic services, such as “errands” to local destinations (examples are pickup of prescriptions or a small grocery order), and free smoke alarm batteries (described under #22 below) and free LED lightbulbs in the outdoor fixtures above our garage doors..
#4 - What happens if a member wants to exceed the six allowed services per month? N4N members are entitled to receive up to six services per month. For practical purposes, and to provide extra flexibility to our members, this requirement was relaxed to 18 per quarter (91 days). In extraordinary cases and with Board approval, the requirement is relaxed still further (only one time) to 72 per year. How is the service usage rate measured? Usage is recalculated every day and takes advantage of services no longer within the 91 (or 365 day) control period ~ i.e. the last 91 or 365 days. We refer to this as a rolling calendar. EXAMPLE: If someone used 18 services in the first week of January, they would have reached their limit by the second week of January. In essence, they have been provided 12 services on credit, which is well above the 6/month N4N commitment. Additional services would become available as soon as the early January service dates move out of the 91-day window (i.e. first few days of April). May unused services from months past be “banked” for future use? We manage this as a continuous process based on need. The 18/month (or 72/year) limits do not start and stop on any specific calendar date such as the first of the month or renewal date. However, we do make provisions for special-need circumstances (see FAQ #4). How do these calculations relate to renewal dates? They don’t. We offer this process without regard to the member’s annual renewal cycle. EXAMPLE: If a member was granted special-need circumstances to increase their limit to 72 (for 365 days) when they were only two months from renewing, we would provide additional services essentially “on credit” with the assumption they would renew. In this scenario, they effectively have a service mortgage pending renewal. When are services privileges restored for special-need circumstance cases? When the 72-service limit is reached, service privileges are suspended for three months. Then, services are restored again at 18/quarter limit. How are these calculations handled and who does them? When a member calls dispatch to make a service request, the dispatcher (using the iPad) calls up member usage history and determines if the member has reached 18 services. The calculation is done by the database the instant the dispatcher makes the inquiry and looks only at services completed in the last 91 days. How many special-need circumstance cases have been approved by the Board? Several members have been given special approved expanded requests of services over 18/quarter (NoS.91). Since March 1, 2011, three member accounts have reached the 72 boundary and then been made inactive. Today, there is only one special-need member at 69. All other cases have used the expanded number of services to address short-term needs (e.g. physical therapy) and then returned to normal usage of no more than 6 per month. #5 - Is membership open to anyone? No. We restrict membership to residents of our gated community. #6 - Did you get help from the community association? Not directly. Our community association, as a non-profit mutual benefit corporation, cannot “own” another non-profit. We formed as a separate corporation and receive no financial or staff support from the association. However, we were granted a sort of “club” status and so are able to rent meeting rooms and buy space in the community magazine, and have slots for our membership applications and brochures in the community “things to do” carousels. Indirectly, we got valuable help from our community association’s corporate counsel, who favored our project: he donated several hours to create our corporate bylaws and filings with the State of California. #7 - How about help from outside? We receive donations from several clubs in our community; a realtor gifts a membership to the new residents to whom she has sold a home; two realtors help by paying for certain promotional materials. #8 - How did you publicize the launch? We advertised in our community newspaper, whose circulation is restricted to residents of Sun City Palm Desert. We also got support from the “district delegates” in our community (there are 15 of them who represent the 15 geographical areas into which our community is divided) who featured the project in emails to and meetings of their constituents, allowing our board members to appear and speak in person. However, most of our new members hear about us by word of mouth. #9 - How successful was your launch? It wildly exceeded our hopes. We figured on maybe 100 members in the first year. We reached that number in six weeks! At the end of our first year, by 3/1/2012, we had 300+. Our success was partly due to the very low cost—only $50 per household per year for six services per month. It was a real challenge to get our volunteer teams viable enough to support the requests even though we had spent about two months training volunteers. (Be careful what you wish for (:-)) By the beginning of the fifth year we leveled off at about 14% of the “market” of 5,000 homes, or approximately 700 households. #10 - How much turnover in membership do you experience? Each year some members move away to senior care facilities, move to be closer to family, or pass away. And new members join. So far, these numbers have been about the same. This “turnover” population now averages about 15 per month or 0.25% per year. Sometimes, the passing of a member does not mean that the household is no longer using Neighbors 4 Neighbors services. 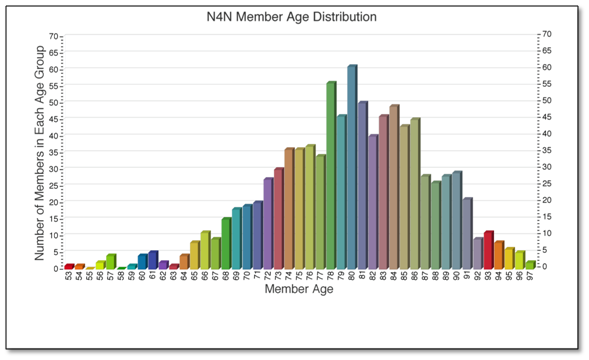 Since we started N4N, 110 members have experienced loss of a partner. Of those 110 survivors, 67 are currently active members. Ten of these survivor-members have used 10 or more services in the past year. One member has reached 43 services over the past year—all Going My Way services since she no longer is able to drive due to visual impairment. #11 - How do you process new volunteers? An Application is received and entered into the database. The volunteer attends a 90-minute orientation providing an overview of our village scope, history, work practices, and performance; what we do and do not do. General policies and procedures are explained and discussed. This includes work rules for all volunteers and how to handle typical and off-normal work situations when interacting with our members. Special emphasis is placed on work safety, member security, and strict control of sensitive information. New volunteers are interviewed and vetted by our Volunteer Coordinator (VC) These interviews are one- to-one conversations carried out in a comfortable situation such the volunteer’s home or in one of the community clubhouses. The volunteer provides information about their daily life in SCPD including clubs, social activities, previous and current volunteer commitments. Data from the volunteer’s application is reviewed and validated. DVI policies are reviewed, questions answered and clarified. The scope of DVI services is explained including time commitments and individual responsibilities. Specifics include providing services to DVI members, submitting monthly time sheets, and interfacing with the dispatcher team (for work assignments), the importance of listening and learning from their Team Leader and/or trainer about how to provide successful services. During this process any remaining questions are addressed. The VC stresses people skills, asks open ended questions, draws out information from the volunteer application (e.g. what made you want to be a volunteer? ), asks for info given at the orientation and addresses concerns maybe not expressed or addressed. After explaining the team activities, and what might be needed to be successful on a team, the VC stresses the quality leadership of the TL and the opportunity to change team assignments as needed. The volunteer then indicates the service they would like to support. If the VC determines we have a good fit with the applicant volunteer, the service Team Leader is notified and team-specific training is scheduled. #12 - Do you have any employees? #13 - So who does the work? We are a virtual operation with no formal offices. Except for team meetings, everyone works from home (or Starbucks :). Our tracking of income and outgo is performed by our bookkeeper and our treasurer, who use cloud-based Quickbooks. #14 - How do your members request services? Members call our Dispatch phone line. We use one dispatcher per 9 – 5 shift to receive requests by telephone, 9 to 5, Monday thru Friday. Dispatchers use one cell phone which is handed from one day-shift dispatcher to the next (so it’s always the same phone number) each evening. On a busy Monday, we might receive 40+ service requests; other days are slower. We might receive about 400 service requests in a month. The service request information is keyed by the dispatcher onto an iPad in real time. (We used to use paper!) In database terms one service request results in one database record. These requests are then assigned to volunteers who have been vetted and trained for the service(s) they support. When each requested service is completed, the volunteer notifies dispatch with miles driven, time spent and any relevant comments. All of this is made possible thanks to our FileMaker database. We also have a web site that provides a means to make requests for services online; this is not an interactive send/receive tool. It can only be used for sending requests. Currently, only 1 – 3% of our requests are sent electronically from the web site; perhaps this is a reflection of the average age of our members: 80. A specially trained e-dispatcher rakes the service requests off the web site. We focus on closing out all requests in a timely manner; no duplication of effort, no missed or orphan requests, and most fix-it jobs completed within 1 – 2 days. Since 3/2011 we have closed out 12,000+ jobs. We have driven 70,000+ miles without losing anyone. We use a service request–aging trigger to create alerts for scheduled work that has not yet been closed out. Our e-dispatchers monitor REPLY email from volunteers to formally close out open dispatch log records in the database. We encourage and depend on a high level of personal communications between the requesting member, dispatch and the volunteer. No “electronic” step is taken before we talk to each other. This avoids confusion with no missed commitments. The volunteer “owns” a job once assigned. Everything we do is focused on assuring timely services to our members. We use email to confirm verbal agreements between dispatch and the assigned volunteer, not as a substitute for the personal, voice dialog. The “village” aspect of our operation is reinforced continually through personal contact up and down the organization. Feedback we get from our members indicates they enjoy talking to someone rather than relying on computers. When they hang up the phone, they know we have their request. This may change as new (younger) members join us, but for now this works. Almost all of our new members and volunteers are the result of personal recommendations from friends. We have tried other methods to promote what we do, but with limited success. There are certainly many obvious advantages to an interactive web interface for “service order” transactions as it would save much time, be simple, and be much less labor intensive. But we believe we enjoy wonderful support from our members and esprit de corps in the ranks of our volunteer teams because of the person-to-person, day-to-day interactions we have. #15 - How did you arrive at the decision to migrate from paper to iPads for dispatch? We started with a simple database using “free” software and avoided spending real money on something like Club Express or SalesForce. Here we are four years later with a custom-designed FileMaker database which functions as the essential engine to run all aspects of what we do. Needless to say, we have spent “real money” for software, leasing a network server, buying web services, and purchasing iPads for our dispatchers. Our database is based on a computer (and associated iPad) app called FileMaker. We post this secure database on a commercial server so it may be accessed by anyone with the correct software, an internet connection, and approved credentials. It is constantly evolving to support new needs and issues. Ninety-seven percent of our 400+ requests each month are handled by telephone. All reporting, record keeping, performance metrics, communications to/from volunteers, etc. are handled by our ever-evolving FileMaker database. Each month we add a new feature or refine an existing component to expand the role of our database. Does this custom software solution work for us? Yes. Could it be an off-the-shelf solution for another village? Doubtful (not without much tech support). Would this have been possible without technical skills from a volunteer working as a consultant-like resource? No. Could we dumb-down what we do and make it fit in something off the shelf? Yes. Would we want to do that and give up on features and capability? Definitely no. We have concluded that “IT” (e.g. consultants) is in our future and we are taking steps to explore how best to address this need over the long term to make our solution sustainable. #16 - How do your dispatchers like using iPads? Early on, our dispatchers worked with paper and pencil and communicated the details regarding service requests to volunteers over the phone. Eighteen months into our operation we introduced iPads to create service requests (while on the phone with the member) and verified all verbal information to volunteers with follow-on email. The response from both the dispatcher and volunteers was initially very negative (it was a big and scary change for many of our volunteers). After much work to train the dispatchers we now enjoy great support from both parties. Dispatchers are now comfortable and enjoy the opportunity to learn and brag to their friends and grandchildren “… those new script triggers for network logon are working great.” With this change, the volunteers now have no need to write anything down. They pick up their emails on smart phones, call the member to confirm service times, etc, do the work, and then use reply to email the job close-out information back to dispatch. We are using electronics but we balance this with people talking to people. This seems to work well for our village. NOTE: a large component of our volunteers are not in Palm Desert during the summer. Some travel and some go live somewhere else for six months. Much of the database work is handled by volunteers who are not physically in SCPD for months at a time. For example, all of our e-dispatchers are seasonal residents. They continue to work each week but from Bend, Oregon, Salt Lake City, Seattle, etc. #17 - What considerations are involved in record keeping? One of the first decisions you may wish to address is how are you going to accept, record, track, assign and close out member requests. And, how are you going to maintain timely member usage counts. Many villages use web-based products like Club Express. We chose a person-to-person phone-based model (although we do accept on-line requests) and a custom database. Anytime a member needs something, they hear a voice on the phone or someone knocks on their door. #18 - How do you handle renewals? The database does all the hard work: creates a monthly renewal package which includes a one-page printout for each renewing member’s information of record. We ask the member to mark up the printout with any changes and return it with a check for $100. This information is used to update member records. This provides a manageable-sized population monthly workload for our MC to talk to the members, sort out questions, and generally get some one-on-one feedback on how we are doing and how they are doing. Our business model is to be very hands-on with emphasis on personal communications. Our average member age is 80 ranging from 53 (probably a care giver) to 97. #19 - What are your most popular services? Transportation—rides to local destinations. For many this is the primary reason they become a member. Another is replacement of smoke alarm batteries, described in #21. #20 - What are the specifics of your transportation service? Do you charge over and above their membership fee for each ride? If not, how do you limit the number of requests from each member? We have no limits other than the six services per month. How popular is this service with your membership? For a 12-month period, transportation usage might grow to 200+ member/households because some need only short term help for things like chemo or therapy after an accident or surgery. Others use our transportation service every month. With the size of our village and an average age of 80, there are many variables in play. By the time we had been in operation for about four years, we had provided 5,200+ trips totaling 70,000+ miles ranging in length from 1 to 94 miles (round trip). 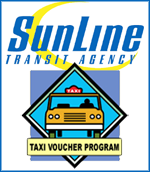 This transportation service represents 39% of all N4N services provided. What is your backup plan for when a volunteer doesn’t show up for a ride they have signed up to provide? This happens rarely, but in such cases, the member calls dispatch, who then contacts our Volunteer Coordinator, who investigates the incident with the Team Leader and the volunteer. What happens when a member isn’t home for a ride they have requested? We consider this a “no answer” situation to be investigated asap, and, through several methods, eventually FIND the volunteer to assure they are safe. Also, if they schedule a ride and, for whatever reason, do not show, we count this as one of the six services per month provided by their membership agreement. What other issues lie in the transportation area? You may have several issues to resolve. For example, will your members call a person (dispatcher) to schedule a ride, or will they post a request on line and wait for someone to respond? How many days ahead will they need to make a request? What if they request more rides per month than allowed by your membership fee? How will you keep track? Will you tell them never to consider your service an alternative to calling 911? We do, but some members still try to avoid calling emergency services. Have you tried financial incentives to get more drivers to volunteer? Gift cards? Mileage reimbursement? And if so, did this impact the insurance coverage? We considered many options including paying our drivers. But the financial commitment to have many “employees” and the associated cost burden of minimum wage restrictions, benefits, and taxes was cost prohibitive. We eventually adopted a policy of reimbursing costs of using personal vehicles at the rate of $.25/mile. This is important to a few, but most drivers refuse to accept this financial help. (No impact to insurance coverage.) The best recruiting method continues to be friends sharing their experience with their friends who might be new drivers, and the very positive feedback they personally get on a day-to-day basis when helping our members. As corny as this sounds, the personal satisfaction and unique opportunity to contribute to our village effort seem to be key drivers (no pun intended) to recruit new volunteers. We continue to be a no-employee, 100% volunteer village. #21 - What are the specifics of our smoke alarm, free battery replacement program? We have about 675 members residing in our 5,000-home community built 10-20 years ago. Many homes still have the original smoke and carbon monoxide detectors which need to be replaced. These are ceiling units connected directly to the home electrical wiring and use the 9-volt batteries only as a backup. 1) FREE BATTERIES: We purchased bulk quantities of extended life 9-volt batteries at a cost of about $1.05 each. When a member requests help with a chirping smoke or carbon monoxide unit, we replace all of their detector batteries (usually 4-5 per home) using our “free” batteries. These batteries have a five-year shelf life and should not require any attention for years. Note: This assumes they experience no extended power outages which would cause the batteries to discharge. 2) TRACKING REQUEST FREQUENCY: For all members, we track the frequency of requests for detector battery service. If we they receive two detector services in a 12-month period, we flag the account and recommend detector replacement. If they receive three within 12 months, we tell the member we will not install any more new batteries until they replace their smoke detectors. When our dispatchers create dispatch log entries, battery replacement history is displayed along with other the member information. The logistics of counting, tracking, alerting, and providing this information is handled behind the scenes by our database. The net result of this practice has been a valued new benefit to our members, a safer community, and much time saved by our very busy Helping Hands team. For $5-6 dollars per home we are saving many hours of volunteer time while making the member household safer. We have implemented this practice both as member requests are received for “emergency” battery service and also when members request new batteries as a preventive maintenance measure— before they start chirping. #22 - What do you do when a member or volunteer dies? Our Member Coordinator (MC) calls the surviving spouse or the in-case-of-emergency contact (family, close friends or trustees) about six weeks after the passing. These are condolence calls in celebration of the life of the deceased; our MC has spent time with them in their homes looking at pictures, listening to their stories and sharing tissues. #23 - What lessons have you learned since your launch in 2011 about operating a village? We should have planned on a much more rapid expansion. We should have begun with a higher annual membership fee; after a couple of years we raised it from $50 per year to $100. We lost some members but the total soon rose back to former levels, and a couple of years later is still rising. We must constantly emphasize recruitment of new volunteers. The original paper-based dispatch operation was unworkable. We congratulate ourselves that our Board Member/Database Manager is a techie and a workaholic; he has initiated, performed and overseen a stupendous amount of technological advancement. We need to provide a for-hire iPad and computer guru who can help our dispatchers and others with necessary training, setups, troubleshooting, etc. The Membership Coordinator, Volunteer Coordinator and Orientation Facilitator provide essential support services. The annual “welcome back” party in the Fall for returning volunteers, and the “thank you” luncheon near the end of the winter season are fun and useful in fostering loyalties. Our community sponsors a well publicized “Club EXPO” in November of each year, and we participate in strength with a lot of volunteers to tell our story. This helps us gain new members and new volunteers. A survey of our members was undertaken to see what affordable additional services might be offered; several options were put forward and we are working out the possibilities for the future. If you would like to download a PDF file of our FAQs, you will need Acrobat Reader.